I want to talk about how the proposed bibleref microformat follows each of the assumptions Tantek lists. “Solve small specific problems rather than big problems…. By focusing on those rather than the big hard problems we get more done, and we learn important lessons (and perhaps even create a few building blocks) that make solving the harder problems easier.” An example of a big problem is the one posed by Axel about book-chapter-verse references not being unique identifiers because of different versification schemes. To my knowledge, only Logos has solved this problem, and they need a 57-MB data backend to support it. (57 MB != small problem.) It’s great that Axel brought up this problem; it’s an excellent one to solve, but it’s beyond the scope of a microformat solution—at least for now. “Re-use existing vocabularies where possible, rather than inventing your own vocabulary/language (in contrast to XML culture).” HTML has a built-in tag for handling citations (<cite>), and using the class and title attributes as bibleref does falls both within the letter and even the spirit of those attributes. In contrast, an alternative way of specifying a Bible references is to invent a new protocol (<a href="bibleref:John.3.15">…</a>). This approach immediately breaks all browsers on the planet, rendering the links useless to the people who want to read the passages. “Provide a solution to marking up data in existing web pages, rather than asking publishers to create machine-only side files in a new format.” Ah, external files. Recommendations that you not create a separate, “accessible” site for your content have a pragmatic underpinning: the flashy, inaccessible site will get all the developers’ attention and updates, while the accessible site gets updated occasionally or never. Similarly, even if you want to keep a running tally of all your Bible references, you’ll still need to indicate their existence in your primary content. Either you’ve just doubled your work, or you’re already using some sort of microformat to allow automated parsing. The central theme behind these assumptions: Microformats aren’t (and don’t need to be) perfect; they’re good enough. If you didn’t have any real-world constraints, you might not take the microformat approach. But real-world constraints are why I think Sean’s bibleref proposal is so effective: it doesn’t solve everyone’s problems, but it solves one problem well. A Google search for [class-bibleref] turns up discussions about the microformat, but not much actual usage. (And I know more people have used it than turn up in the search results.) I want a way to find and aggregate people who are using bibleref. Most of the value in the bibleref microformat (in my opinion) comes from seeing how others are citing the Bible. None of us is in the search-engine business, unfortunately (unless you are—in which case, how about making elements’ class attributes searchable? ), yet we still need some way to unobtrusively find and catalog microformat occurrences. In other words, the presence of the microformat itself should suffice for a search index; it’s not realistic to ask people to add other tags to their page to work around search engines’ current limitations. But perhaps I’m getting ahead of myself. Or maybe Sean at Blogos has a grand plan that he’s going to unveil in January at the BibleTech08 conference. All the occurrences of the word said in the Bible. Note the narrative bands in Genesis, the Old Testament history books, and the gospels. Occurrences of the words father and son. Clusters in Chronicles and a couple of places in the New Testament show where to find the genealogies. Occurrences of the words Moses, David, and Jesus. It’s easy to tell where the main stories about each person are. 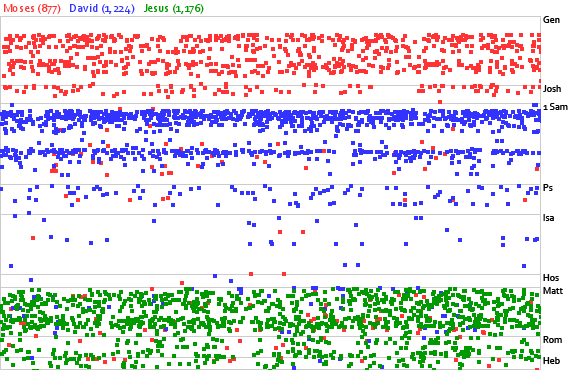 Part of the Similar Diversity work includes a visualization of the word you in various holy books. This visualization provided me the impetus to produce something more interactive for the Bible. First, I counted the number of words in the ESV Bible (767,847, including headings but excluding footnotes, if you’re interested). Next I assigned each word in the Bible a unique, incremented number. Then it was just a matter of going through the positions and grouping them by word. The result is a database table with two columns: word (varchar(18)) and positions (mediumtext). The positions column consists of a space-separated string of numbers. The code is in PHP, using the GD library. I decided this project would be a good time to try out the SQLite database that comes with PHP instead of going with MySQL. I have no complaints, though Perl creates incompatible tables with current PHP versions (5.2.4) unless you use PDO in PHP to access the tables. It worked fine after a bit of Googling revealed the workaround. Since the chart is 1/4 full-size, each pixel represents four words, and each dot occupies nine pixels. Given the coarse resolution, it’s best to use the locator to identify trends and then switch to the Bible text for further analysis. It doesn’t do exact matches, only beginning-of-word matches. Only want to search for Eve, omitting results for evening? You’re out of luck. 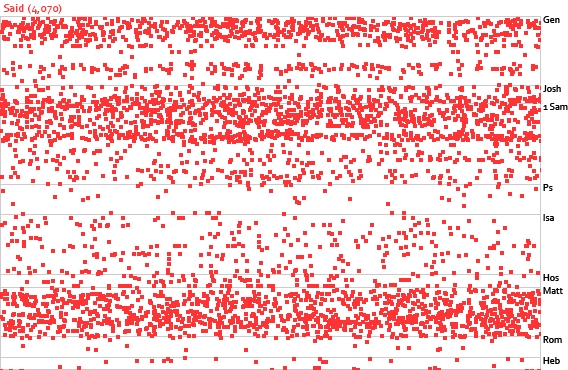 It would be interesting to be able to click a dot and see the context of each occurrence. Launching this tool gives me an excuse to launch the new Labs section of this site, which houses small, one-off experiments like this one and the Chapter Browser. 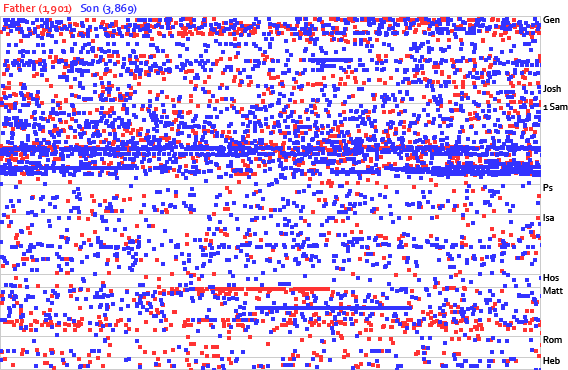 Many Eyes is a data-visualization site. 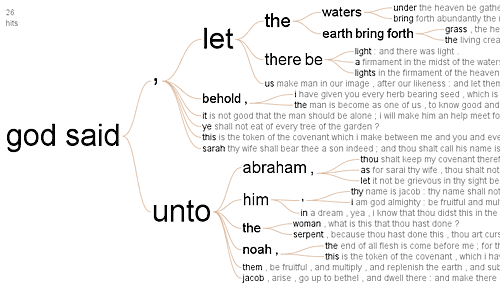 They just introduced a word-tree visualization, which takes a body of text and lets you find phrases surrounding a word. One of the creators of the site uploaded this data set for Genesis (KJV). Create your own visualizations (like the one above) from this data at the site. An interesting addition would be to let you enter more than one node. For example, entering “God” and “Abraham” would show you all the different words and phrases that connect those two words. You are currently browsing the OpenBible.info Blog blog archives for September, 2007.